Temperatures aren’t the only thing heating up this summer. List-to-sale times are blazing, much like they have been for the past few years — on average, homes are being sold within 64 days, down from 77 days in April 2017. April 2018’s list-to-sale time marks the eighth consecutive year of annual declines and is a new record low for listings on Trulia. 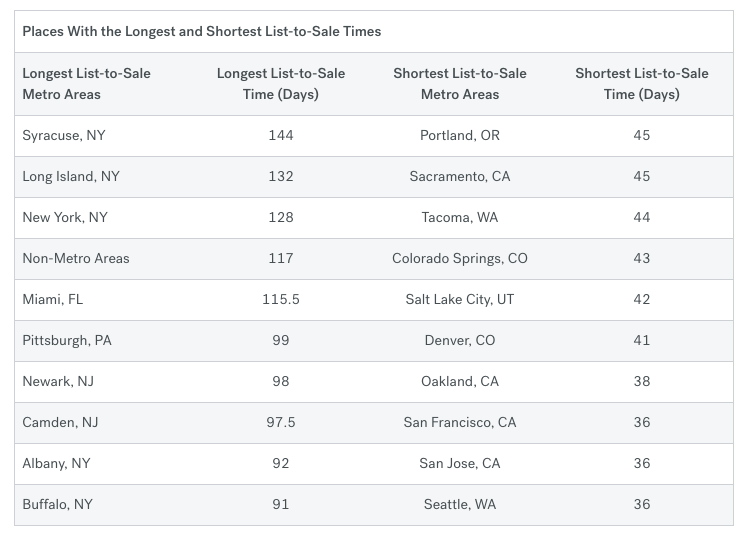 Seattle, San Francisco and San Jose are home to the quickest list-to-sale times, with listings being snapped up within 36 days. Buyers in New York, on the other hand, have more time to consider their options. In Syracuse, the list-to-sale time is 144 days; and trailing not too far behind is Long Island at 132 days, and New York City at 128 days. Syracuse, New Orleans and Honolulu are the only three markets out of the 100 largest metropolitan statistical areas (MSAs) to experience longer sales times compared to last year. Buyers bought starter and trade-up homes at breakneck speed, while premium homes lingered on the market. In April, premium homes stayed on the market 13 days longer than starter homes and 15 days longer than trade-up homes. The gap is expected to narrow as we move into peak summer homebuying season, but it will widen again as fall and winter draw near. “During the 12 months ending April 2018, premium homes sat on the market a median of 19.5 and 23.2 days longer than starter and trade up homes, respectively,” noted the report. In April, the only two markets where premium homes sold faster than trade-up homes was Detroit and Toledo, Ohio. And over the past year, premium homes have sold quicker than starter homes in 24 percent of the nation’s 100 largest MSAs. List-to-sale time on Trulia measures the median amount of time in which homes that were sold during a given period were on the market over a given geography while attempting to remove foreclosure and real estate owned (REO) sales. For this report, we looked at monthly intervals of home sales going back to January of 2010. Typical measures of days on market usually count the time between listing and when a home goes under contract. Our measure tracks the number of days between listing and when a home’s official transaction date occurred based on public records. This can make our measure of days on market look longer than the industry standard but, we feel, also better represents the actual time it is taking for transactions to go through the whole process. 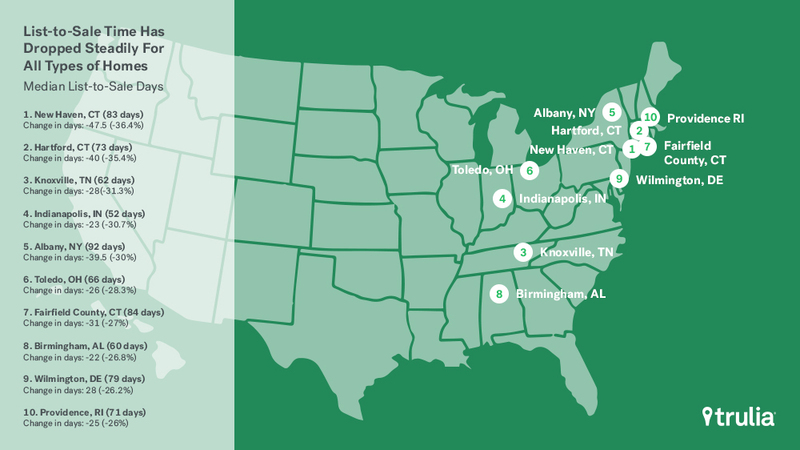 National and local Days on Trulia figures by price tier are calculated using starter, trade up, and premium price tiers for all metropolitan areas (or divisions where available) in the country. We define the price cutoffs of each tier based on home value estimates of the entire housing stock, not listing price. For example, we estimate the value of each single-family home and condo and divide these estimates into three groups: the lower third we classify as starter homes, the middle third as trade-up homes, and the upper third as premium homes. We classify a listing as a starter home on the market if its listing price falls below the price cutoff between starter and trade-up homes.